Quite a week at Bear Creek! It began with 3 inches of snow at 30 degrees and ended at 70 degrees and sunshine! I began the week by joining Ben and two other volunteers (Catherine Hu and Antonio Xeira) in monitoring the creatures that live in our vernal pools – the wetlands that fill in the spring and mostly or completely dry by middle or end of the summer. I’ll be sharing both my photos this week and, with his permission, the photos of Antonio Xeira, an avid birder from Portugal and a fellow lover of the natural world. It turns out that Bear Creek’s vernal pools are teeming with life! And new life began to assert itself in the rest of the park, too, as the weather warmed. The first woodland flowers thrust out of the earth, a few more migratory birds rode in on the wind, butterflies spread their wings in the sunlight, turtles basked and swam while the frogs sang and salamanders left floats of eggs in the vernal pools. Finally, on a perfect spring Saturday, humans appeared on the playground lawn enjoying the spring sunlight with their fellow creatures. A lovely week. Who Knew Bear Creek Hosted Shrimp and Clams? 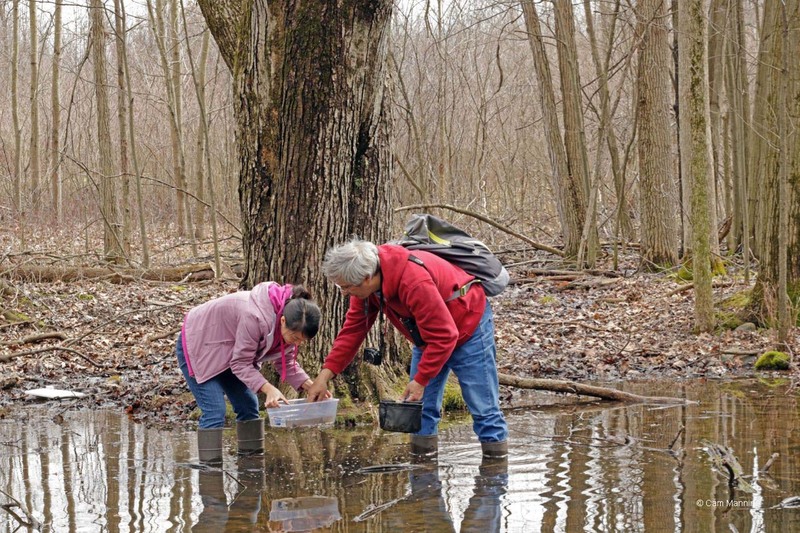 Volunteers Catherine Hu and Antonio Xeira examine their finds from a vernal pool. Michigan Natural Features Inventory is leading a project to map and monitor vernal pools, something never done in Michigan before. Since these wetlands dry up for part of the year, they are particularly vulnerable to being filled in. But scientists are finding that vernal pools are “biodiversity hotspots” of the forests. Late fall or early spring flooding of these pools stimulates dormant creatures to awake and others to hatch as the water level rises. The “indicator species,” the ones normally present in a vernal pool, are, among others, wood frogs, fairy shrimp,and a variety of salamanders. We sampled four ponds and found evidence of these species. 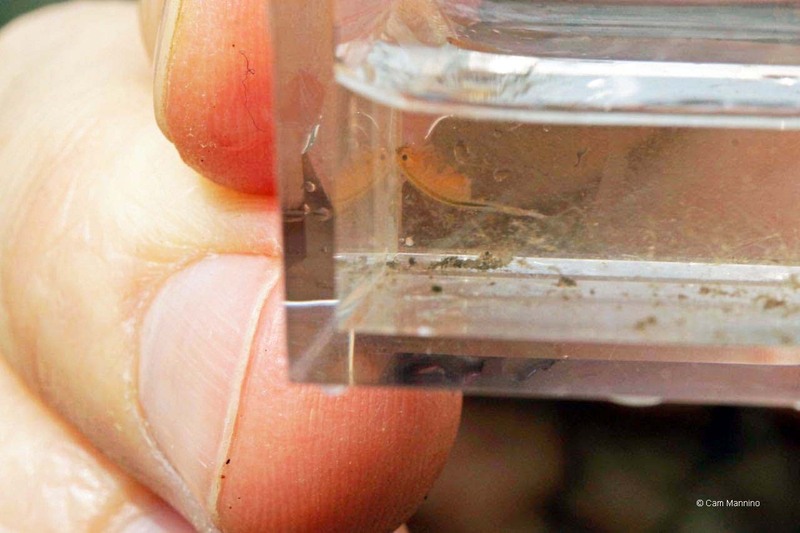 Fairy Shrimp (Order Anostraca) are .5 to 1.5 inches long, swim upside down and look like a tiny version of the shrimp sold at the seafood counter! According to the website of the Vernal Pool Association, their sets of 11 leaf-like legs do several things – propel them through the water, gather food (algae, bacteria etc. ), and take in oxygen from the water. Here’s a female with an egg sac attached, and eggs visible inside! 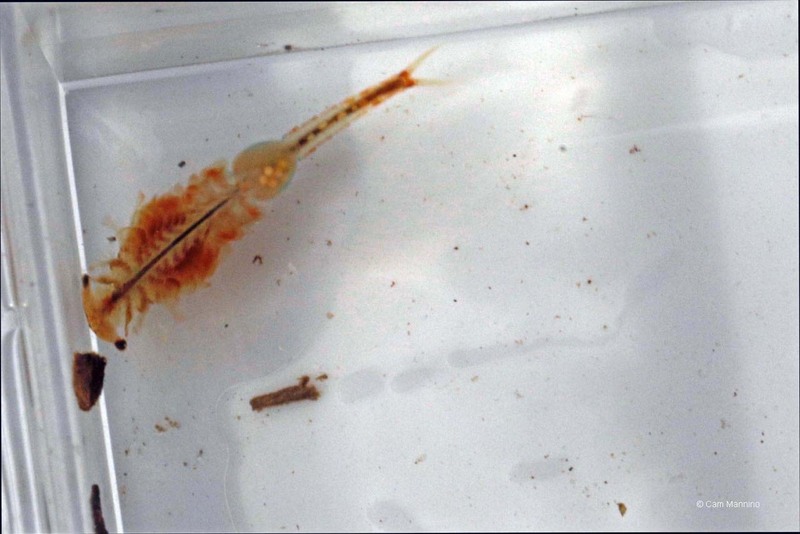 A female fairy shrimp with full egg sack attached. The salamanders had already mated, laid their eggs in the water and disappeared under logs or leaf litter. But their egg sacks, attached to twigs, were pretty impressive! Ben thinks the larger egg masses are Spotted Salamander (Ambystoma maculatum), with Blue-spotted Salamanders (Ambystoma laterale) laying smaller egg masses or individual eggs. Salamander egg sack attached to a stick in a vernal pool monitored last year. The dragonfly larvae feed on salamander eggs attached to sticks in vernal pools. More migratory birds are passing through to cooler climes or coming to spend their summer with us. One late afternoon on the far side of the Center Pond, I watched a Belted Kingfisher (Megaceryle alcyon) perch, watch carefully and suddenly dip down into the water with a rattling call. Belted Kingfishers excavate 3-6 foot bank-side tunnels for nesting which slope upward to keep out water. Fossils indicate that they have graced ponds for 600,000 years! This fellow was a male; a female has a rust-colored belt across her belly, making her one of the few female birds who are fancier than the males. 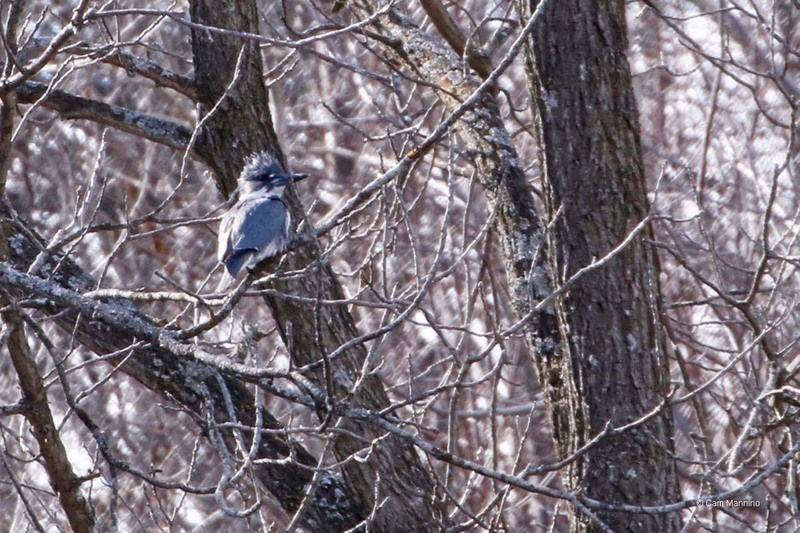 A Belted Kingfisher makes a rattling call before dipping down to eat from the Center Pond. 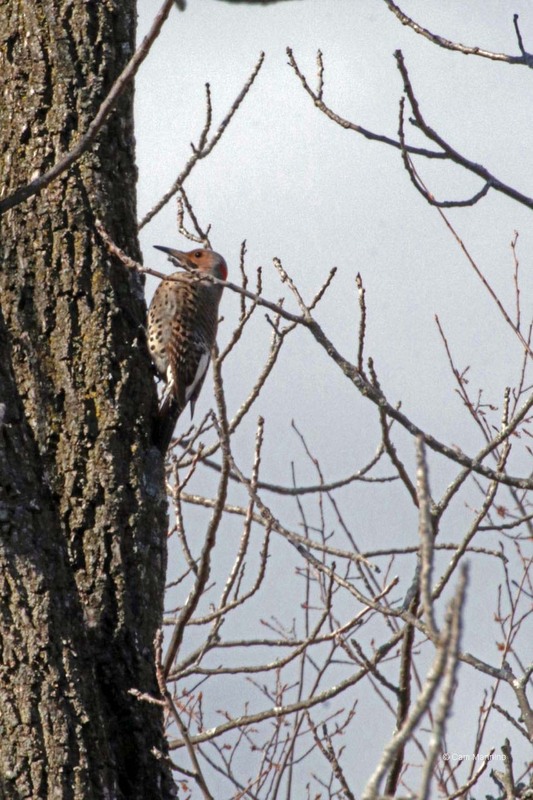 The Kingfisher will spend the summer with us, as will the Northern Flicker (Colaptes auratus). These beautifully spotted birds can be identified in flight by a flash of white on their rump. They’re high in the trees now, probably searching out nest holes. But since ants and beetles are a favorite meal, you can spot them poking their long beaks and barbed tongues into lawns or trails too. An unusual posture for a flicker who normally uses its barbed tongue and long beak to probe the ground for ants and beetles. A tiny migrant arrived this week too, the hyper-active Ruby-Crowned Kinglet (Regulus calendula). With a constantly flicking tail, these restless birds move from branch to branch, rarely alighting for more than a few seconds. This one is just passing through on its way to breed somewhere in Canada. Its “ruby crown” only appears when it’s excited so I guess this one felt relaxed, despite its hyper behavior. This Ruby-crowned Kinglet is just stopping by on its way to spend the breeding season in Canada. 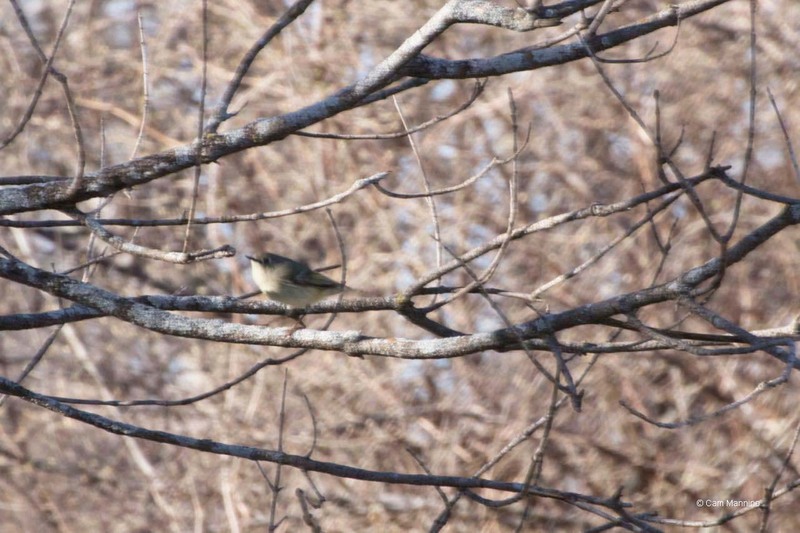 A pair of Eastern Phoebes (Sayornis phoebe) hung out near the kiosk at Gunn Road. They were clearly checking it out as a possible nest site. Once she starts laying eggs, however, the female will chase this male away from her mud-and-grass nest. A pair of Phoebes were checking out the kiosk near Gunn Road as a possible nesting site. 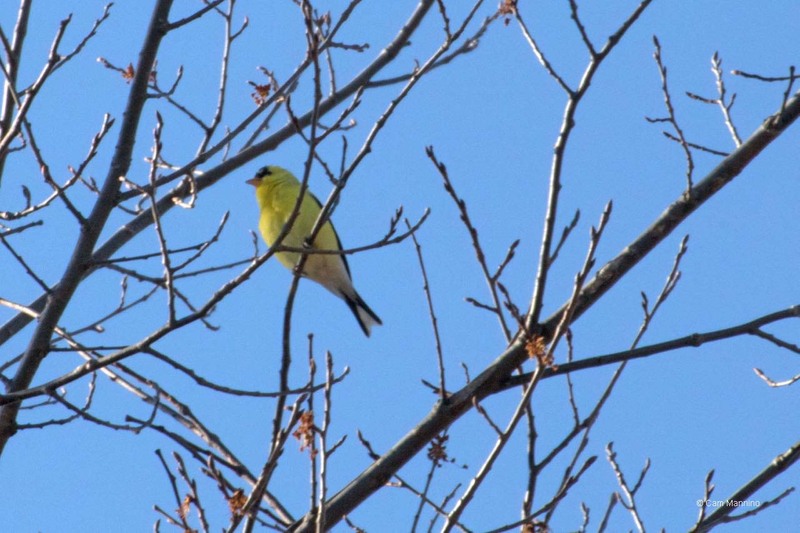 I don’t often see American Goldfinches (Spinus tristis) at Bear Creek during the winter, though they stay in the area. My theory is that they’re all at neighborhood thistle feeders! But admittedly, they’re easier to spot now that the males have donned their bright yellow summer feathers. A male American Goldfinch has molted into its bright summer colors. Flowers and Butterflies – It’s Definitely Spring! Most years, I don’t see any woodland flowers until later in spring. The earliest to emerge are usually Spring Beauties (Claytonia virginica). But right now at Bear Creek, those lovely little flowers have only their leaves coming out of the ground in the dappled light of the woods. 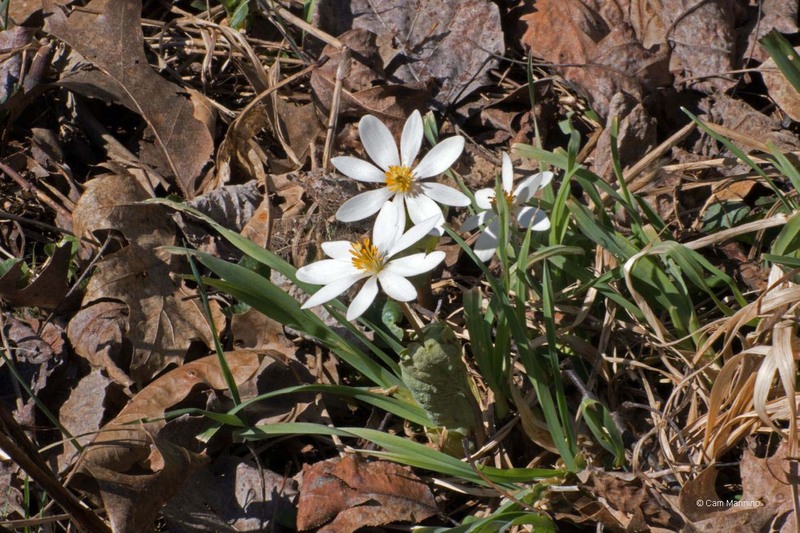 But another of my early spring favorites, with the un-poetic name Bloodroot (Sanguinaria canadensis), is blooming along the western side of the Northern Loop. Notice how the flowers arise before the furled leaf below has opened – unusual in plants. The leaf will make a circular cloak around the flower once it’s fully open. The leaves of the Bloodroot unfurl after the flowers appear, eventually making a round cloak around the blossom. Two butterflies fluttered over my shoulder on Saturday. Both of them spent the winter months as adult butterflies, hibernating in a frozen state under loose bark or in tree cavities. 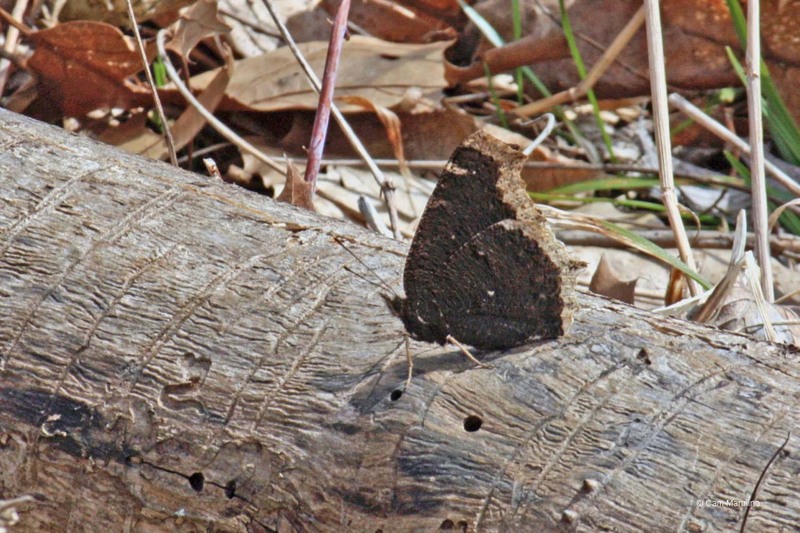 Mourning Cloaks are frequently the first butterflies out and about in the spring which means they start the mating process earlier and have more broods than many migrating butterflies or ones that hatch in the spring. 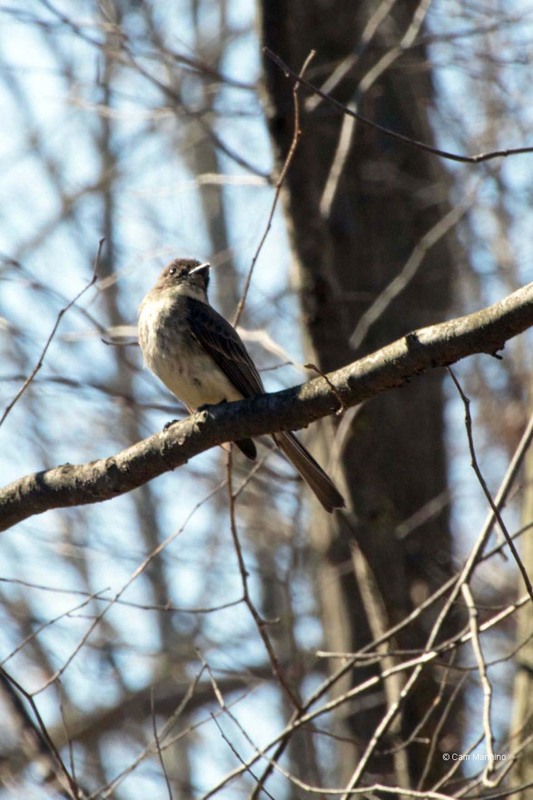 This one quickly winged its way to the Oak-Hickory forest – perhaps hoping for oak sap to rise soon and fill wells made by sapsuckers. Sap is one of its favorite foods. Nice winter camouflage, eh? It looks like loose bark, especially with its wings closed. The Mourning Cloak has blue spots on it wings when they are open. The Mourning Cloak emerges early in spring after hibernating under loose bark or in a tree hole all winter. 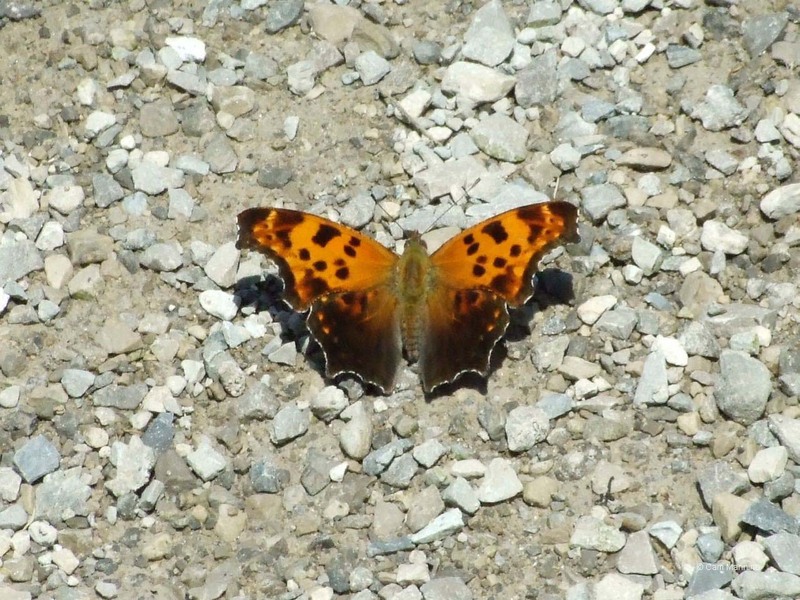 A small Eastern Comma (Polygonia comma) fluttered around me, landing on the trail. It also favors tree sap and spends the winter in frozen hibernation as an adult. 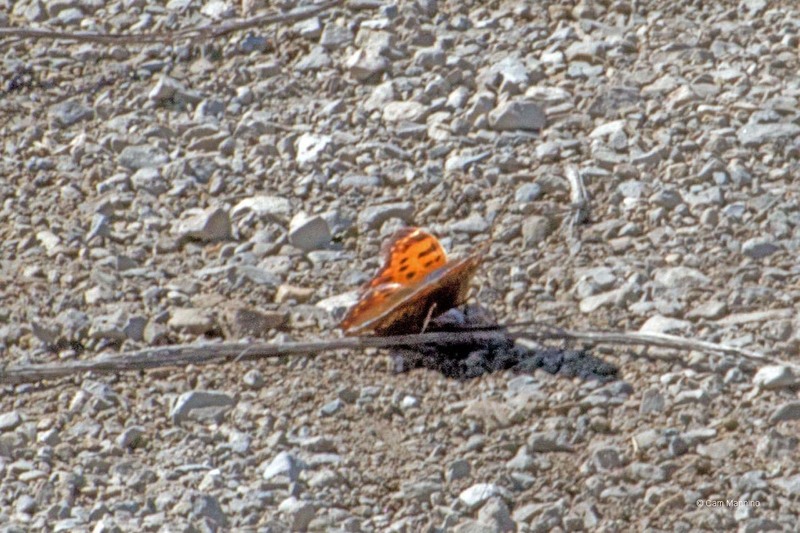 The one I saw Saturday was tiny, restless and hard to photograph but it was still wearing winter colors – hindwing mostly orange with black spots (in photo at left). In the photo below, taken in a previous June, a summer-form Eastern Comma sports dark hindwings. Basking Feels So Good in the Spring! A Garter Snake (genus Thamnophis) had climbed onto a small tree in one of the vernal pools we monitored last Monday and dropped into the water as Antonio, one of the volunteers, approached. No doubt it was interrupted while trying to soak up some sunlight after frigid Sunday weather. 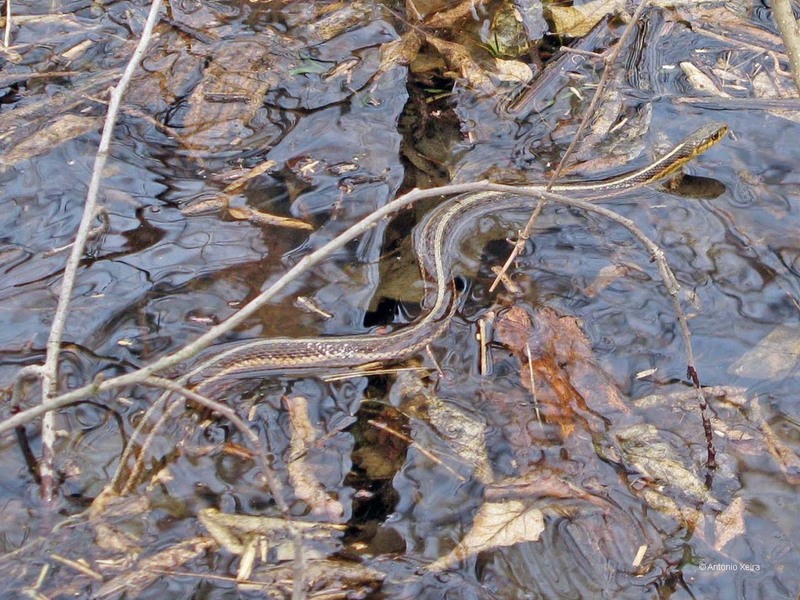 A snake probably basking in a small tree, dropped into a vernal pool where Antonio Xeira took its photo. Fourteen Painted Turtles (Chrysemys picta)shared logs in the Center Pond, soaking up the sun of the first really warm day. Like snakes, turtles are reptiles which can’t regulate their body heat except through activity. So most warm days turtles stick out their heads, necks and legs to capture the sun’s heat on their extremities as well as their dark shells. 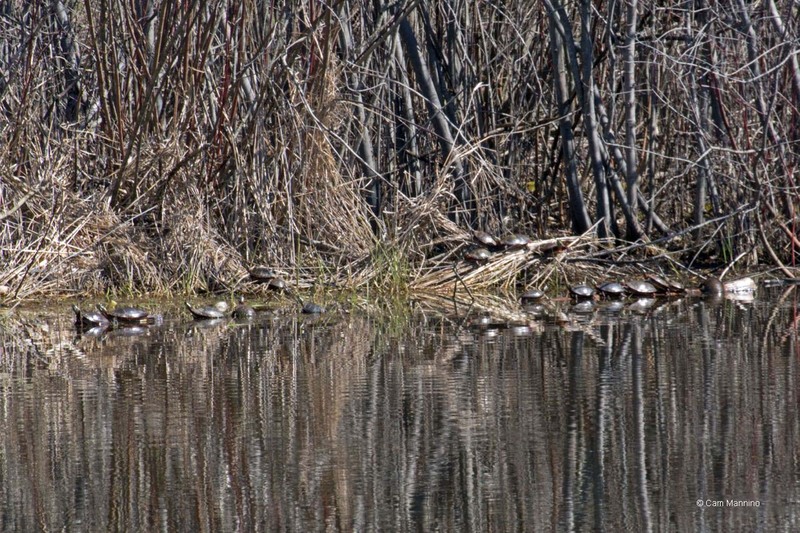 Fourteen Painted Turtles soak up the sunlight at the Center Pond. I saw my first Snapping Turtle (Chelydra serpentina) on Saturday as it cruised the marsh. 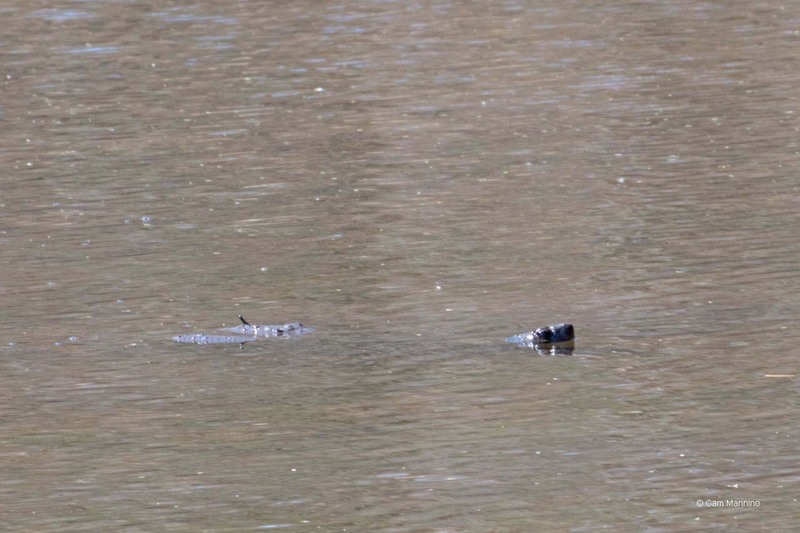 It was feeding below the water with its long neck and then poking its head out for a breath of air. It must feel great to eat and swim after a long winter under the ice. A Snapping Turtle cruising the marsh for food and a little sunshine. And human denizens of the park came to Bear Creek on Saturday to eat and bask in the warm sunshine, too. This family (whose name I unfortunately forgot to get!) graciously allowed a photo of their picnic on the grass with a lovely little human in a big hat to protect her from the spring sunshine. 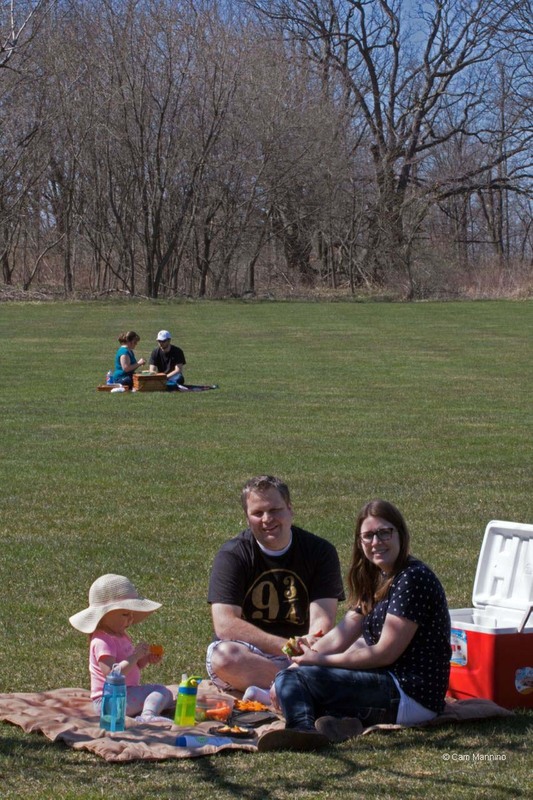 Families picnicking and basking at Bear Creek on Saturday afternoon. So much life in this 107 acres, eh? 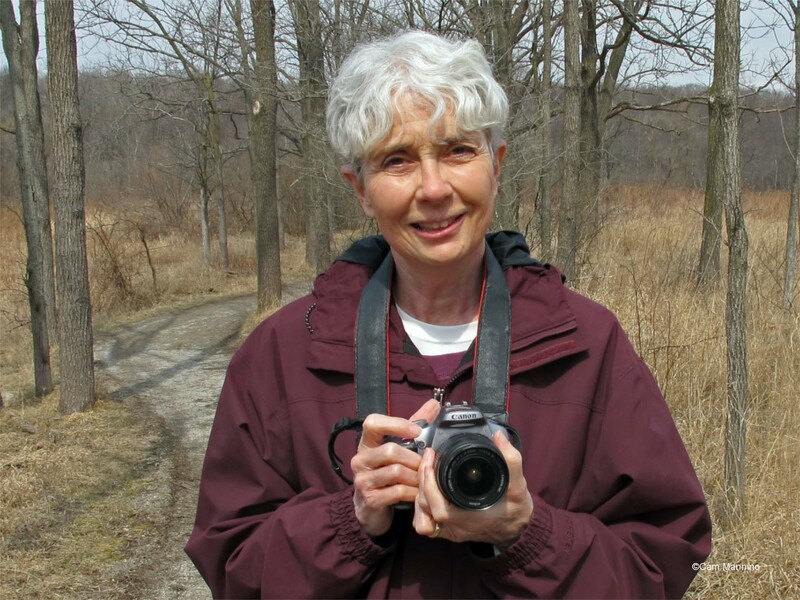 Within the shady vernal pools, on logs at the Center Pond, on bare tree limbs, in the grass on the edge of trails and on the green carpet of the playground, the park hummed with life by the end of the week. After a white-and-black, silent winter, the color and song of spring greet us like a warm smile. I hope you’ll be there, too, smiling back.